Day 8 of my 12 days of Nerd Lacquer. I don't quite no why but i see this and I think of a winter wonderland. I know that sounds totally lame. But I see the snow and ice, and just want to go skating at central park! 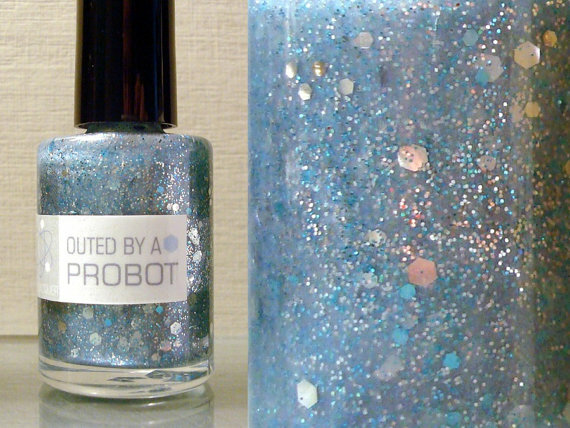 Amanda describes this one on her website as a shimmering opalescent silver-blue with silver, iridescent, and sky blue glitter plus medium blue hexagonal glitter, plus large silver hexagonal glitter. Semi sheer, but quite opaque in two coats. Excellent top coat over your favorite silver, blue, or grey lacquer. For me at least, this is certainly NOT opaque in two coats as you will momentarily see from the swatches. It is however stunning. it is a a very pale shimmery ice blue with sky blue and silver glitter, large silver hexagonal glitter and light blue glitter that looks to me to be both round AND hexagonal. Over one coat of a black creme, one coat over a blue creme, and two coats on its own. Super pretty. I especially love it over blue!